This could be the worst Spanish rail disaster in 40 years. 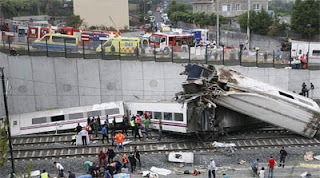 At least 56 people were killed and 111 are injured when a train derailed in the northern Spanish city of Santiago de Compostela, Wednesday, July 24, 2013. Rescue teams are battling to help passengers trapped inside the train. Some rescuer clambered over the derailed twisted train trying to get survivors out of the windows. According to Alberto Núñez Feijóo, head of the surrounding Galicia region, noted that at least 56 people were killed and at least 70 injured, more than 20 of them seriously. Spanish officials cited the reason of tragic accidents was due to "a difficult curve," the train jumped the tracks as what they're described. One passenger said, "The train started flipping over, over and over, and carriages ended up on top of others." Another said, "It was going so quickly. It seems that on a curve the train started to twist, and the wagons piled up one on top of the other." Renfe, Spain's national rail company admitted that the service was running 5 minutes late, fuelling the hypothesis that it was trying to make up time. While the French train operator SNCF said, "that accident may have been caused by a loose steel plate at a junction." Comments or suggestions about "56 people killed at Spain train crash | Santiago de Compostela" is important to us, you may share it by using the comment box below.